Marcus Maddison created both Posh goals at MK Dons. Photo: Joe Dent/theposh.com. Peterborough United’s players were impressive from 1-11 in the 2-0 League One win at MK Dons today (August 27). 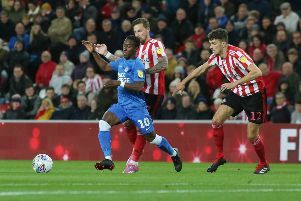 But teenage midfielder Leo Da Silva Lopes and captain Chris Forrester were the best of an impressive bunch according to the Peterborough Telegraph. Posh goal-scorer Andrew Hughes battles with George C Williams of MK Dons. Photo: Joe Dent/theposh.com. Posh striker Tom Nichols in action at MK Dons. Photo: Joe Dent/theposh.com. Callum Chettle: (for Taylor, 73 mins). Shaquile Coulthirst: (for Nichols, 85 mins). Jermiane Anderson: (for Edwards, 90 mins).